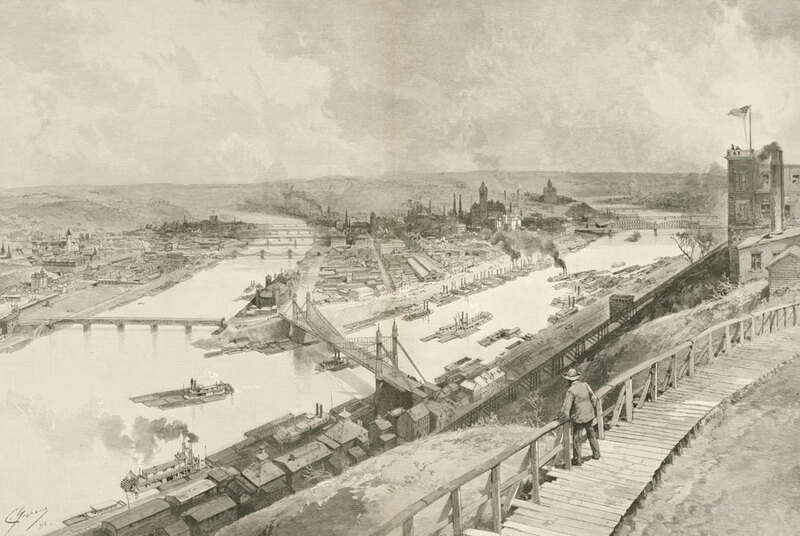 Drawing of Pittsburgh in the 1890s. Internal division was rife among Irish nationalists on both sides of the Atlantic in the late 19th century. In 1893, the London parliament defeated a second legislative attempt to give Ireland limited domestic autonomy, called Home Rule. The rejection prompted new calls to use terror-style violence to break from Britain once and for all. For the Irish in America, debate over how to support their homeland also was increasingly tangled in U.S. domestic politics. 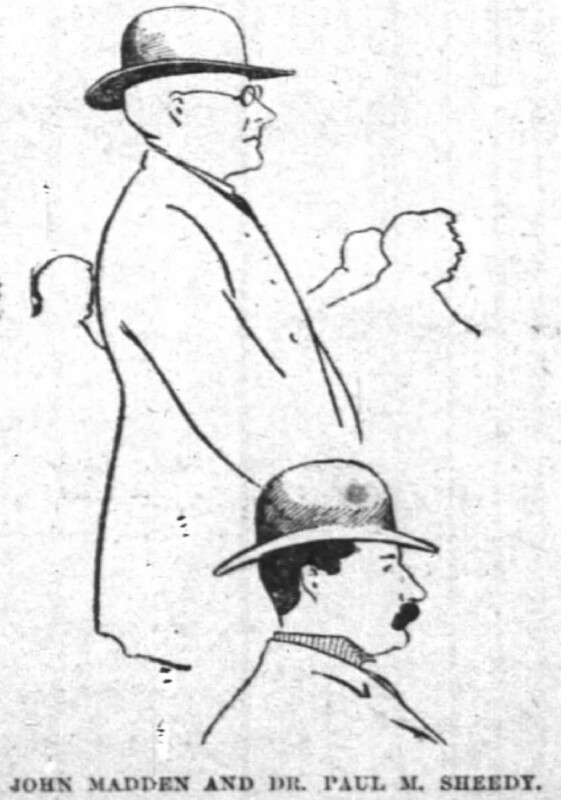 An 1895 Chicago newspaper illustration of Madden and Sheedy. 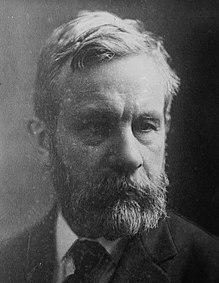 Madden’s and Sheedy’s conflict with the Chicago convention leaders sprang from their loyalty to Irish nationalist leader John Devoy, who was exiled to America in 1871 for treason against Britain. In the 1890s, Devoy and rival Alexander Sullivan were locked in a feud for control of the Clan na Gael (Family of the Gaels), a U.S.-based fraternal organization intent on establishing an Irish republic. Their fight began in the 1880s as Irish Parliamentary Party leader Charles Stewart Parnell made the first attempt for a Home Rule deal with British Prime Minister William Gladstone. A Sullivan-supported “dynamite campaign” directed at civilian targets in England became a fiasco of negative publicity. One of Devoy’s associates alleged the Sullivan faction embezzled $100,000 of Clan funds. Sullivan’s side claimed the accuser was a British spy, and his murder soon after deepened the feud. Then, in 1890, revelations of Parnell’s extramarital affair derailed Home Rule and split his political party. The disgraced leader died the following year. Afterward, “a disillusioned and embittered Ireland turned from parliamentary politics” and entered “a long gestation” toward the violent revolution that erupted from 1913 to 1923.5 In America, the Clan feud simmered, mostly behind the scenes, but is revealed in the numerous letters to Devoy from Sheedy, Madden and others in Western Pennsylvania in the months before the 1895 Pittsburgh rally and Chicago convention. Their surviving correspondence, held at the National Library of Ireland,6 documents the Clan’s organizational strategies, finances, recruitment, internal fighting, gossip, and even a death threat. Sheedy, Madden and other key participants in the 1895 events immigrated to Western Pennsylvania after Ireland’s Great Famine. Most were educated men with successful professional careers, the vanguard of a growing Irish middle class. They had the money, connections, and inclination to get involved with politics in Ireland and America. In September 1894, Dr. Sheedy helped to organize the first “Irish reunion” of the John Boyle O’Reilly Literary Society, named after the Irish nationalist poet and journalist who in 1875 conspired with Devoy to help six Irish rebels escape from an Australian prison. Altoona newspapers did not report any political speeches at the reunion, held at the Wopsononock resort in the Allegheny Mountains west of Altoona,14 but Irish freedom was surely discussed among the 1,500 people who enjoyed music and dancing, bicycle and foot races. 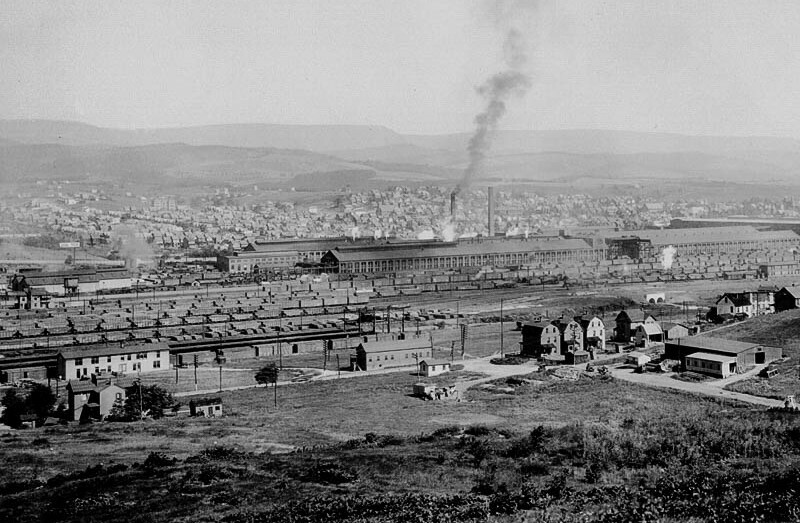 Altoona in the late 19th century, with Pennsylvania Railroad shops in the foreground. Paul Sheedy also became a physician. He emigrated in 1892, about age 24,15 and briefly practiced medicine with his brother John from the same Altoona address.16 By 1894, Paul moved to Pittsburgh’s Wilkinsburg neighborhood,17near his other brother, Morgan, the St. Mary’s pastor. In addition to their public activity covered by newspapers, Paul and John Sheedy, Madden, and Carrick also knew each other from their membership inside secretive Clan na Gael chapters, called “camps.” Their surviving correspondence to Devoy begins in October 1894. Paul Sheedy wrote to Devoy about his confrontation with William Lyman, a Brooklyn building contractor and owner of the Irish Republic newspaper. Lyman was running Sullivan’s ground operation and had become the faction’s effective leader by the time he visited Western Pennsylvania. To reassert his control, Devoy spent most of the winter of 1894-95 traveling to Irish-dominated cities in the Northeast and Midwest.26 He attended the Nov. 25, 1894, “Manchester Martyrs” commemoration in Pittsburgh.27 Paul Sheedy advised him to stay at the Central Hotel in Altoona (“the owner is an Irishman”) during December 1894,28 as agitation intensified between the Clan factions in Western Pennsylvania. By autumn 1894, word spread that the Sullivan/Lyman faction intended to launch a “new movement,” called the Irish National Alliance (INA). By spring 1895, these “physical force Irishmen” declared the parliamentary movement was dead and that many people believed “the time has come for Irish Americans to inaugurate a new and bolder policy in the interest of Irish independence.”39They wanted to raise an army to drive the British from Ireland. Photo of Pittsburgh in the 1890s. Devoy prepared his Pittsburgh loyalists for a preemptive strike against his rivals’ upcoming convention.43 Part of that effort included the Aug. 15, 1895, Irish rally at McKees Rocks, five miles west of Pittsburgh. At the time, McKees Rocks was an industrial suburb growing from less than 2,000 residents in 1890 to more than 6,000 in 1900. Streetcar service to the area began in 1894, which is probably how most people reached the rally at Phoenix Park, which shared the name of the historic Dublin green where in 1882 Irish rebels murdered two British officials. Stories about the rally appeared in newspapers across America, the crowd typically estimated at several thousand. In Ireland, a Reuters account noted the Pittsburghers’ willingness to use physical force, and their denunciation of the Chicago convention.46 In Scotland, the coverage also caught the attention of industrialist Andrew Carnegie, who made his fortune in Pittsburgh. NEXT: Andrew Carnegie’s view, the Chicago INA convention, and the aftermath in Pittsburgh. Read Part 2. This entry was posted in History, Irish America, Journalism, Politics and tagged Altoona, Andrew Carnegie, Andrew Sullivan, Chicago, Irish National Alliance, John Devoy, John Madden, Paul Sheedy, pittsburgh on October 9, 2018 by admin.